Alan Lyddiard – director of 2016 production Anniversary at the Playhouse – has been revealed as Associate Artist for the theatre. Alan’s role will include collaborating with the Playhouse in developing artistic work with and for older people. 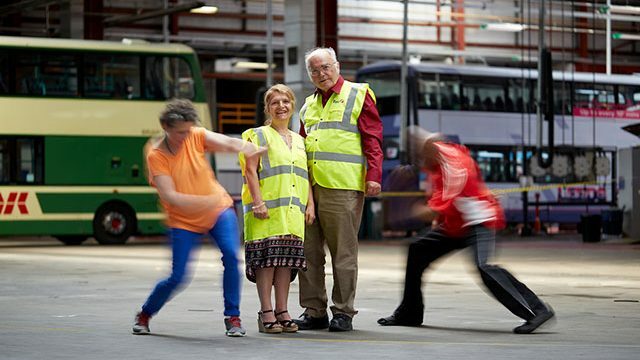 This September, The Performance Ensemble in association with Leeds Playhouse will join forces to create a pioneering community production Bus Ride – part of the Bus Pass project, which is supported this year as part of Leeds 2023. Bus Ride. Photography by Mike Pinches. The performance plays at the Queens Hotel on 16 September and celebrates the lives and stories of older people throughout the city of Leeds. Directed byAlan Lyddiard, the production will feature live music, contemporary dance and stories from the heart of the city. Bus Ride takes place from The Queens Hotel from 16 September 2018. Book online at leedsplayhouse.org.uk or call the box office 0113 213 7700.